The Eagles first-ever Super Bowl win will be a memory we won’t soon forget. When the Philadelphia Eagles soared to victory over the New England Patriots in Super Bowl LII, our lives were forever changed. For generations, a loyal, proud and dedicated fan base wanted nothing more than to see the team finally capture that elusive Lombardi Trophy. Now the franchise and those of us who bleed green along with them can breathe a sigh of relief as this team of self-described underdogs delivered a world championship. 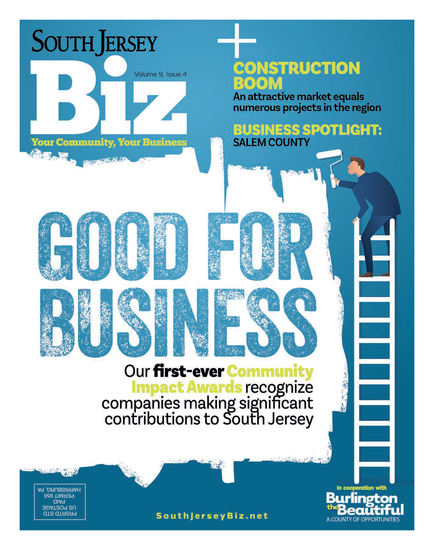 To help celebrate this monumental event, South Jersey Biz reached out to area business leaders and asked them to sum up what this big win means to them personally in addition to examining the local economic impact. There’s no doubt this team has captured our hearts and the love affair is only getting started. The Eagles’ historic playoff run and first-ever Super Bowl win had South Jersey in a state of euphoria during the second half of January and early February. But it wasn’t just fans—many restaurants, bars, grocery stores and retail stores among others in this area had the same feeling, as the win made a huge impact on the local economy. Liguori also mentions how Super Bowl Sunday is one of the biggest “food days” of the year, even when your home team isn’t playing in the big game. “People like to barbecue and cook for the Super Bowl and I think the Philly area is a foodie city, it’s only logical the restaurants and grocery stores experience a lot more impact,” he says. All five Zallie’s ShopRite locations across South Jersey felt the impact, where they experienced a significant increase in their catering department the days leading up to the big game. Local transportation, especially PATCO, also saw a spike in tickets purchased the day of the Super Bowl and the parade. Tickets ended up being sold out mid-afternoon the day before the parade, some waiting in line for up to an hour hoping to snag one. The long lines continued the morning of the parade. Crowne Plaza Hotel in Cherry Hill was one of the hotels in our area that reached maximum occupancy the night prior to the parade, according to Kristin Stahl, director of sales and marketing. “Cherry Hill is typically first to feel this business compression any time Philadelphia hosts a major event. … The parade brought three times the volume of travelers compared to the same time last year,” she says. “We hosted a mix between corporate business travelers who wanted to avoid the chaos, as well as the parade goers. 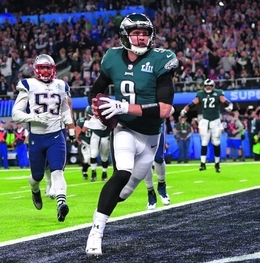 Michael Orr, owner of Nationwide Print- ing and Signs, says he felt the impact the week prior to the Super Bowl when the Eagles beat the Minnesota Vikings. He said this in front of many peo ple, including former governors Jim McGreevey and Donald DiFrancesco, and other distinguished guests in attendance. The reaction from just about everyone— laughter. And when the Eagles did win, Moen was ecstatic and celebrated with millions of others at the parade—something he said he’ll cherish forever. Many companies in our area were also in the Eagles spirit and had celebrations of their own before and after the Super Bowl, like TruMethods in Moorestown. Owner Gary Pica hosted an Eagles hype party the Friday before the Super Bowl where lunch was provided and employees were encouraged to wear Eagles gear. Additionally, employees were allowed to come in late the day after the Super Bowl and they were given a paid day off to attend the parade on Broad Street in Philadelphia. It was a similar scenario at The Bloom Organization. The week of the Super Bowl, the office was decorated with Eagles memorabilia and balloons and like TruMethods, employees were encouraged to wear Ea- gles gear and were given the day off to attend the parade. For those who chose not to go, a party was held in the office and the parade was shown on television. Employees at 7th Level Mortgage were also given off the day of the parade and customers were given special discounts and promotions in honor of the Super Bowl win. Rothman Institute was in the Eagles spirit all season long. They held “Eagle Fridays” once a month where employees who dressed in Eagles gear were entered to win tickets to Eagles games and other prizes throughout the season. Other companies, such as McDowell Law, PC, were in the giving spirit. In honor of the Eagles victory, they decided to sponsor the Maple Shade Youth Baseball league to help kick off their spring season. “After the last play of the Super Bowl, there was this realization that after all these years, they had won. I just thought of what it meant to the city and thought back to all the Sundays spent with my friends and family. It’s something we have in common, something that pulls us together. Going down to the parade, everyone was just so happy, so positive. I don’t know too many things that can do that to the city. It was amazing walking around the city through different neighborhoods and watching the replay of the game on the jumbotrons. It was a great atmosphere. Published (and copyrighted) in South Jersey Biz, Volume 8, Issue 2 (February 2018).